Observation Baltimore recently conducted a survey with 1,200 Baltimore residents pertaining to career engagement. 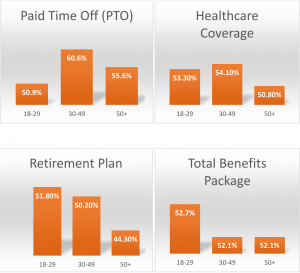 Of the sixty-four percent (64%) who reported working full-time, seventy-two percent (72%) are female, and less than half (47%) are under 40 years old. Household income among those currently working full time is pretty evenly segmented, with twenty-two percent (22%) making under 50K a year, twenty-two percent (22%) making between 50K and 75K a year, nineteen percent (19%) making between 75K and 100K a year, and thirty-seven percent (37%) making 100k or more. For the second of a two-part series, we focused on benefits and workplace culture. A happy employee is a productive employee. When employees can see the positive benefits of their work, it adds to career satisfaction. Companies which promote the positive impacts of their work tend to employ a more fulfilled workforce. In Baltimore, there is no shortage of work which positively impacts people’s lives. The majority (80%) of Baltimore residents surveyed either “agree” or “strongly agree” with the statement “My organization’s work positively impacts people’s lives”, with participants ages 50+ having the highest approval rating at (81%). Another key indicator in workplace satisfaction is the company culture. No one wants to work in an environment that does not align with their own values, beliefs, or principles. While most participants across all age ranges said they “agree” or “strongly agree” that they are satisfied with the culture of their workplace, there was one particular age range that appeared to be significantly more satisfied. Seventy-six percent (76%) of participants ages 18-29 viewed their company culture in a favorable light compared to (59%) (ages 30-49) and (64%) (ages 50+). This entry was posted on Wednesday, September 6th, 2017 at 11:49 am. Both comments and pings are currently closed.